PMSC Global: The Final Circle. Regional Semi finalists Compete from Nov. 29th to Dec. 1st For Grand Cash Prize and Coveted Contract to Become Official PUBG Mobile Streamers. 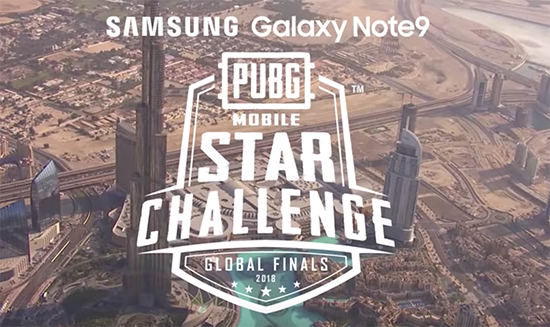 The exciting culmination of the global 'PUBG MOBILE STAR CHALLENGE' (PMSC) Global Finals hosted by Tencent Games and PUBG Corporation (PUBG Corp.) is happening November 29th through December 1st at the Festival Arena in central Dubai. The global finale is sponsored by the Samsung Galaxy Note 9 and brings together semifinalists from regional competitions held in Europe, Asia, North America, South America, Japan, Korea, and China. The top 20 teams from each region are invited to the Global Finals in Dubai to be the winner of all winners, claiming part of the $400,000 prize purse. PUBG MOBILE is based on PlayerUnknown's Battlegrounds, the original PC and Xbox One phenomenon that took the world of interactive entertainment by storm in 2017. Up to 100 players parachute onto a remote 8x8 km island to battle in a winner-takes-all showdown. Players must locate and scavenge their own weapons, vehicles and supplies, and defeat every player in a visually and tactically rich battleground that forces players into a shrinking play zone.